A lot of birdwatchers and rainforest lovers go to Arfak mountains to watch paradise birds. There are several species that can be seen both in the lower and upper montane forests. 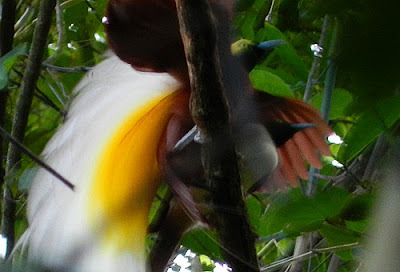 One of the most famous species of paradise birds is the Lesser Bird of Paradise (Paradisaea minor). The birds can mostly be seen in lower montane forest. They like to gather in trees whose branches overlook sunrise. Early in the morning when the weather is clear, male Lesser BOPs fly to the trees to call their female counterparts. Morning sunlight makes their feather looks bright and colorful. 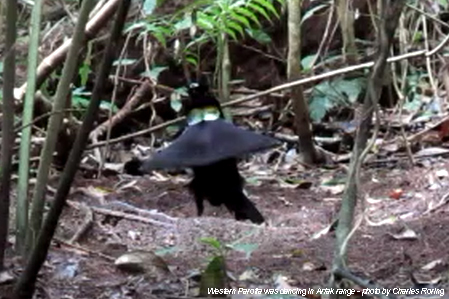 The male birds of paradise will perform courtship dance to attract female lesser birds of paradise for mating. They jump from one branches to another. 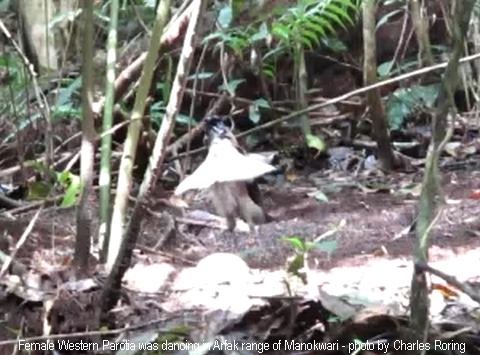 The branches that are used for the courtship dance have been cleared from twigs, leaves and moss. 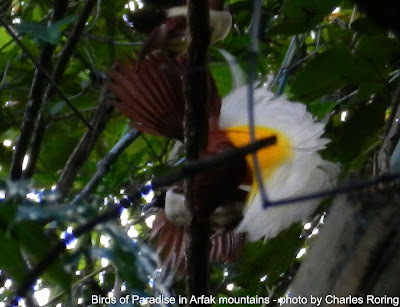 A recommended site for tourists who want to watch these paradise birds is Susnguakti forest. It is located in the south of Manokwari city approximately 1 hour ride and another 1 hour hiking into the jungle. To watch the paradise birds in Susnguakti forest, birdwatchers have to wake up early in the morning at around 4.30 a.m. After eating some food and drinking coffee or tea, they need to leave the their camp for the birding site. Crossing a small stream of cool water in a narrow ravine, they will slowly walk up steep slopes of the Arfak range. 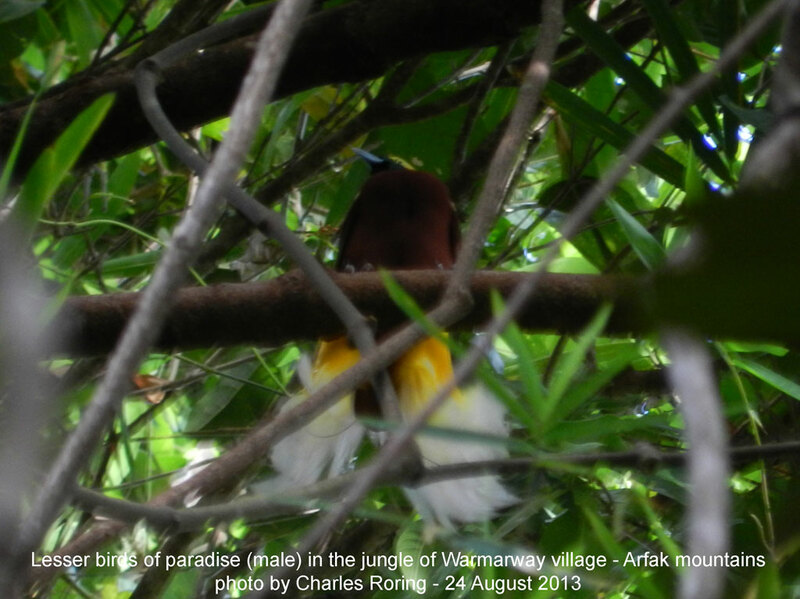 When the sun rises in the east from the horizon of the Pacific Ocean, the male lesser birds of paradise perch on the branches of the trees and begin calling their females. The "courtship dance show" lasts for about 3 hours from 6 to 9 a.m. They can also be seen in the afternoons at around 13.00 to 15.00. 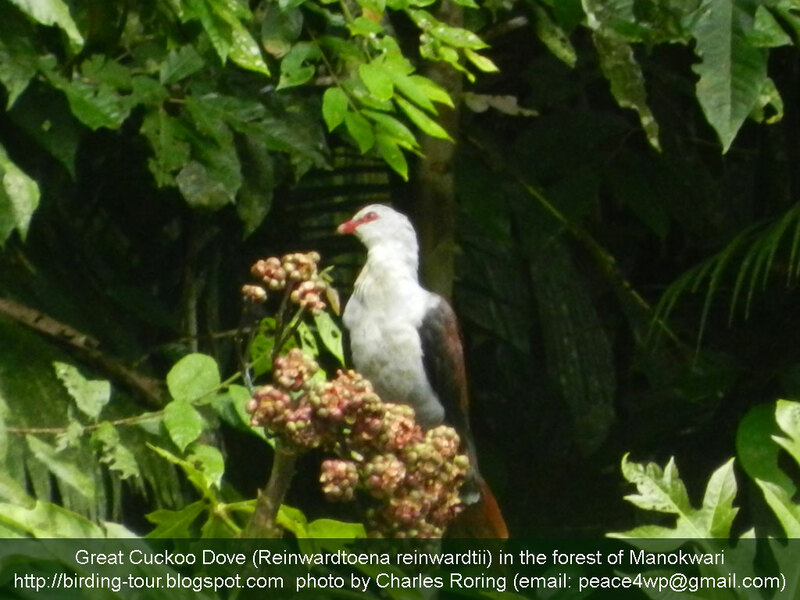 Birdwatchers need to bring a good pair of binoculars or a D-SLR camera that is powered with telephoto lens. The camera that I highly recommend for birdwathers is Canon PowerShot SX50 HS or Nikon Coolpix P600 . It is a compact point and shoot camera that is powerful and affordable. If you understand Indonesian language, please, contact Yunus Sayori (cell phone: 081343316087). 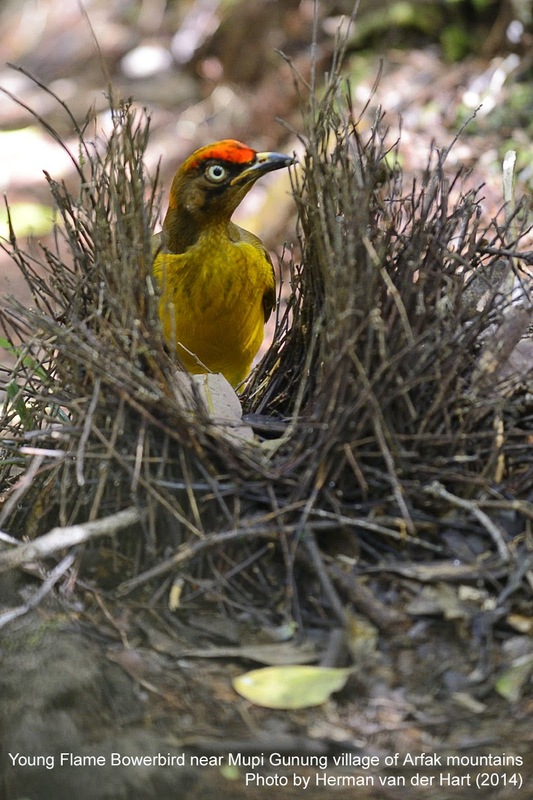 In addition to the Lesser BOP, visitors can also see such species as Western Parotia, Magnificent birds of paradise, magnificent rifle bird, Arfak astrapia. Interested in visiting Arfak mountains? If you want to visit Warmarway village of Arfak mountains, and need an English speaking guide, please, contact Alice Auri by sending text message to her cell phone: +6281248525116.